What do you normally do with your bread crusts? Do you cut them off and throw them away? Usually, we ate them but when I make nice sandwiches, I will slice off those crusts. That’s how I ended up with a huge packet of nice, fresh crust of the bread. 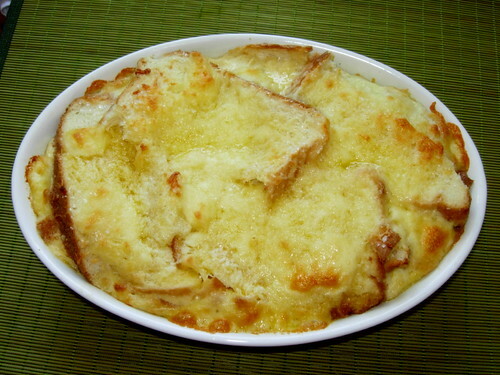 It is too wasteful to throw them away so I decided to make bread pudding with them instead. The crust of one bread or 6 slices of bread. If you are using slices of bread, cut them into triangles or squares. mozzarella cheese – optional. I like to cover the top with mozzarella so that the crusts are not too hard. Beat eggs and milk and sugar. Using a baking dish, layer the bread and add some raisins. Then, layer another layer of bread on top. Pour in the egg, milk and sugar mixture. Sprinkle some mozzarella and granulated sugar on top. The granulated sugar will give it a nice sheen after baking. Leave them for a while until the bread is soaked through. Bake in 200 deg celcius for about 20 minutes or until brown. Actually, you don’t need a recipe. It is just three steps of soak the bread, bake it and serve. My kids love the bread pudding as I didn’t use any cinnamon powder in them, unlike some of those served by restaurants. You can jazz up the pudding with lemon zest or fresh orange juice. The warm pudding will taste even nicer if you serve it with some icecream. I usually cannot resist bread pudding at the buffet line. If I come to Penang, you make one for me, can? can? iLike, iLike!!! I’m going to make this for my kids!!!! i love bread pudding!!! and i love it simple, just like yours. 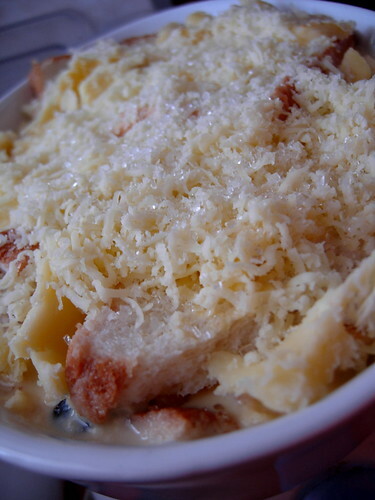 without cinnamon or cherries etc… have never tried bread pudding with cheese on top though. must try. 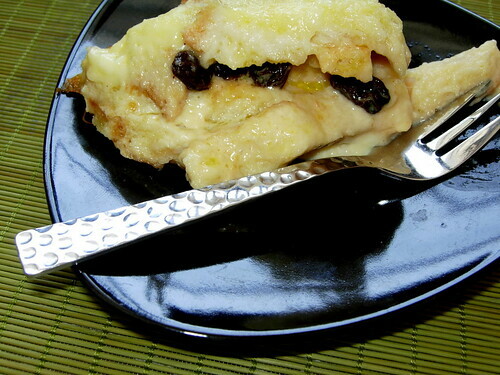 i love bread pudding the best with some vanilla cream sauce! Lilian, the first picture, is that sugar on top of the mozzarella?